These gauntlets have singular articulated plates along the fingers, creating a mitten-like effect over the fingers. These mitten-style gauntlets protect the exterior of the hand, leaving the interior free for weapon control. They also have raised knuckles for unarmed fighting. They can be paired with a thick leather glove. The gauntlets are crafted from approximately 18 gauge riveted steel and are articulated. The thumb plate is affixed with a hinge of brass. The gauntlet is held to the hand with integrated leather strips and an adjustable leather strip with a brass buckle. These gauntlets have singular articulated plates along the fingers, creating a mitten-like effect over the fingers. 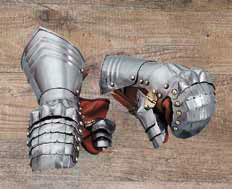 Historically (14th through 15th century), gauntlets were used by soldiers and knights. It was considered an important piece of armour, since the hands and arms were particularly vulnerable in hand-to-hand combat. With the rise of easily reloadable and effective firearms, hand-to-hand combat fell into decline along with personal armour, including gauntlets. This page was last modified on 2 May 2014, at 20:16.